Easily accessible from both Portland and Salem metro areas, the north coast of Oregon offers an abundance of adventure. When the Columbia Gorge crowds have you down and you need a saltier breeze, heading west to the ocean is an excellent choice. From mountain top views, windy beaches, and cool temperate forests, the trails gathered here offer a variety of ecosystems and challenges. Grab your daypack and get out there! 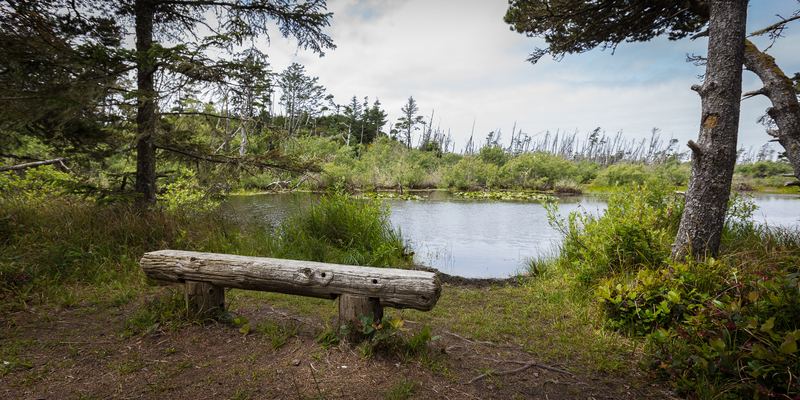 Much of the latter portion of the Fort to Sea Trail is made up of ponds and surf pines. Photo by Shaun Hunter. At 13 miles in length, this is one of the longer trails featured here. The Fort to Sea Trail is a recently constructed trail that leads from the Lewis and Clark National Historical Park’s Fort Clatsop to Sunset Beach, roughly 6.5 miles. With a variety of landscapes like shady green moist forests and rolling open farmland, the trail eventually turns to soft sand. There’s no water when you arrive at Sunset Beach parking area, so you’ll need to pack plenty for the return to Fort Clatsop. Friendly for all hiking levels, there is only 200 feet of net elevation gain along this hike. If 13 miles is too long, a one-way hike can be done by making use of the free parking area at Sunset Beach in order to shuttle cars. This is a dog-friendly trail, so bring your pet and your leash. 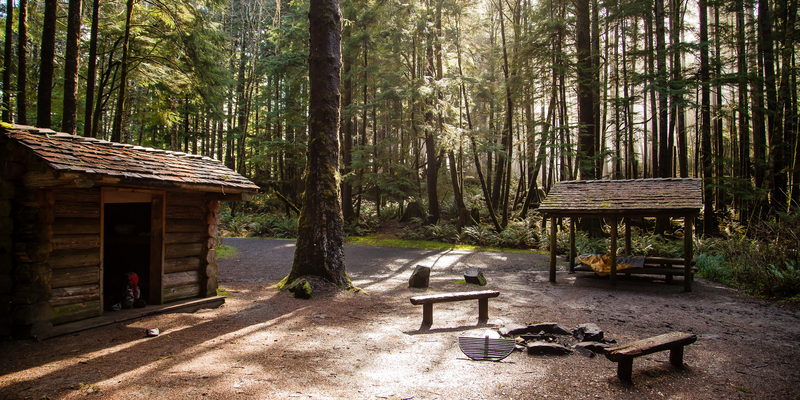 Shelters at Hiker’s Camp on the Tillamook Head trail. Photo by Halvor Tweto. Hiking Tillamook Head can be a one-way or an out-and-back, depending on whether you’re willing to set up a shuttle car in Ecola State Park. Doing an out-and-back adds nearly double the elevation gain on the way, which is important to bear in mind on this roughly 10.5-mile hike. Indian Beach parking lot marks the start of this trail, and the first mile and a half is on a gravel road until you arrive at Hiker’s Camp. Here you can turn the trail into an overnight by making use of several shelters on a first-come, first-served basis. 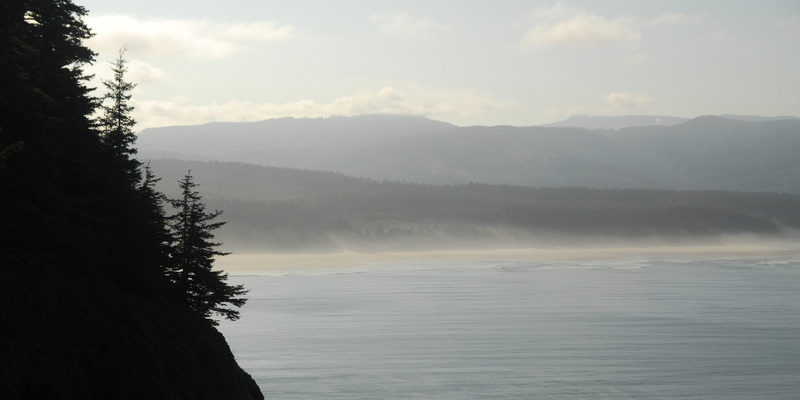 Spectacular views abound on this trail, from the Tillamook Rock Lighthouse to extended coastal vistas. Downed trees can make the trail cumbersome to travel at times, and extra time should be budgeted into your hike to account for this. Dogs are welcome here. Crescent Beach from above. Photo by Asmund Tweto. For hikers looking for a shorter trail or coastal day trippers seeking a brief walk, Crescent Beach Trail is a lovely way to stretch the legs. 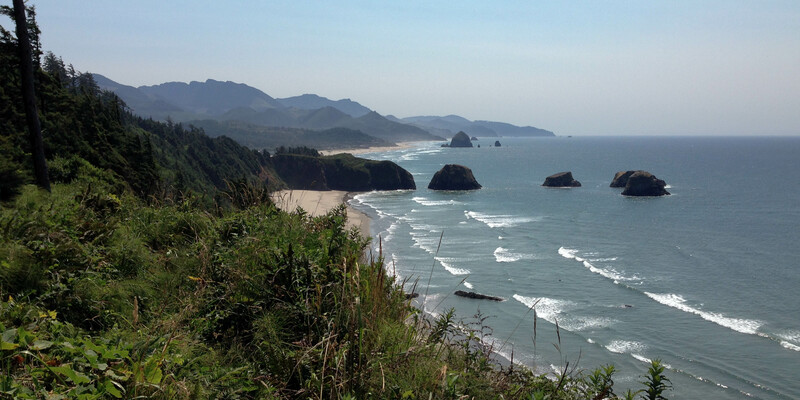 Close to Cannon Beach and Ecola State Park, the 2.5-mile trail climbs steeply at first before easing. Following the ridge, there are frequent ocean and beach views. A short inland jaunt then returns you to a steep drop down to the beach. By Oregon coast standards, Crescent Beach is relatively uncrowded. The occasionally rough trail conditions along with mud and steepness should be kept in mind before setting out. Old-growth Sitka spruce (Picea sitchensis) on Cape Falcon Trail. Photo by Tyson Gillard. The 5-mile round-trip Cape Falcon hike offers up an opportunity to enjoy some of the Northwest’s best preserved old-growth coastal forests. With so few of these types of woods left, this is an opportunity not to be missed. The scale of the trees here is something to wonder at. The mud that can go along with them may also have you shaking your head. This trail can be damp even in the hottest summer months. Breathtaking views, wildflower shows in spring or summer, and little elevation gain make for lovely hiking. Because of all it has to offer, however, Cape Falcon is a popular destination, so solitude will be in short supply here. View looking southeast from Neahkahnie Mountain’s summit. Photo by Tyson Gillard. 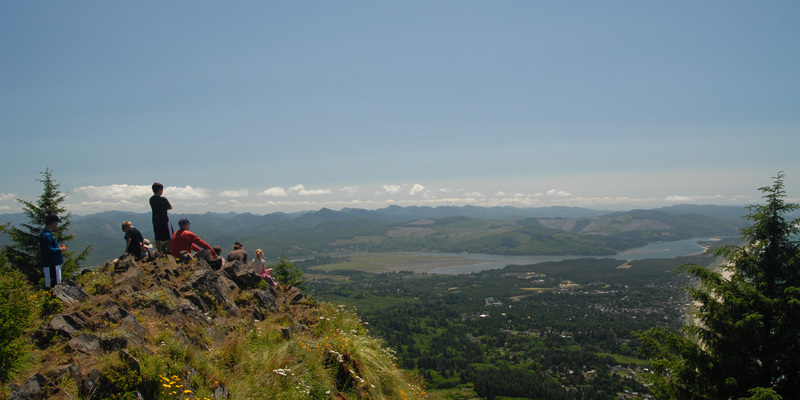 Neahkahnie Mountain provides one of the highest viewpoints on the West Coast. Located in Oswald West State Park, legend has it that Spanish explorers left treasure buried here. While no treasure has been found, you’ll treasure the hard-earned ocean views once you reach the summit. The hike has a net gain of 1,220 feet, and packing a lunch to enjoy at the top will give you time to catch your breath before heading back to the car. There is a slightly easier and more popular eastern approach that reduces some of this gain, and our trail map gives more details. Bayocean Peninsula. Photo by Tyson Gillard. For one of the more quiet beaches on the northern Oregon coast, Bayocean Peninsula is a hidden gem. Just outside of Tillamook and extending 7 miles north from Cape Meares, this spit of land helps protect Tillamook Bay from storms. A rarity along the coast, you can actually backpack here without much of a crowd for company. Starting from the parking area at the end of Bayocean Drive, the trail follows an old gravel road for a bit. 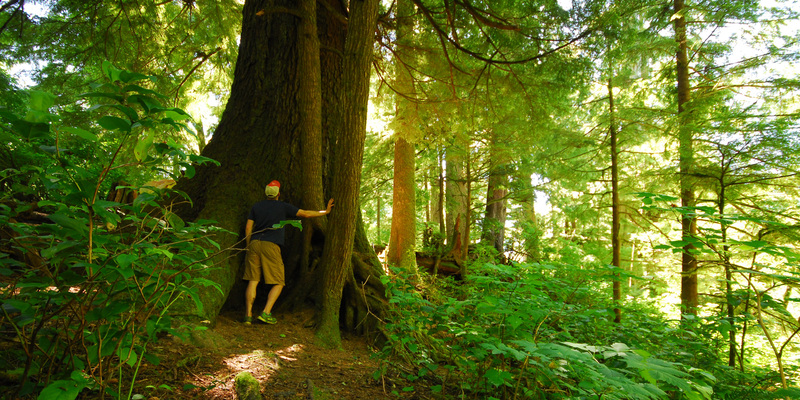 As you hike along on sandy trail through shore pine, salal and even Sitka spruce you’ll find numerous backcountry campsites to choose from. Eventually sand dunes appear along with an undeveloped beach to explore. Don’t be put off by the signs at the peninsula parking are that read “No Camping.” This refers to the prohibition against RV and car camping in the parking area itself, not the peninsula. Also, unlike other trails on this list, Bayocean Peninsula allows horseback riding. Be on the lookout for riders as you travel the area. Cape Lookout State Park and Netarts Spit. Photo by Lisa Holmes. This is one hike where tide considerations are important. Make sure you check the local tide tables before heading out because part of the beach gets cut off during high tides. This trail is best for low tide hours. 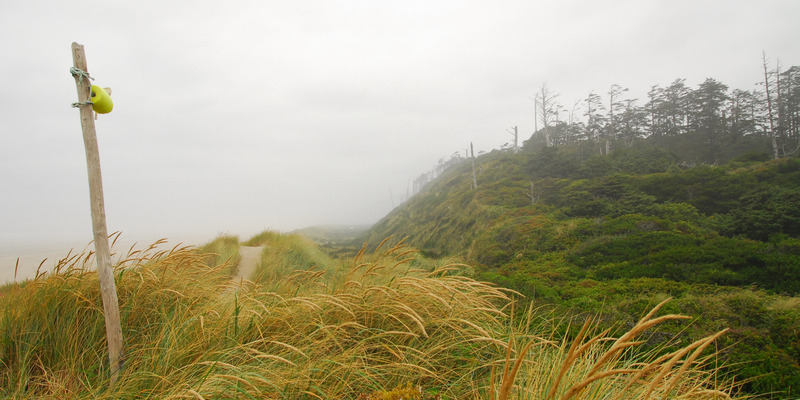 Netarts Spit is part of Cape Lookout State Park, and because it stretches 5 miles out, a round-trip hike here can take some time. Views of the coastal communities of Oceanside and Netarts are visible as you hike, as is the Three Arch Rocks National Wildlife Refuge where more than 150 species of birds are protected. If you’re into clamming, bring your bucket because the mudflats of Netarts Bay are a popular spot for clams. You won’t see huge crowds here, and that’s unusual on this busy coast in the summer. View looking southeast on the Cape Lookout Trail. Photo by Tyson Gillard. 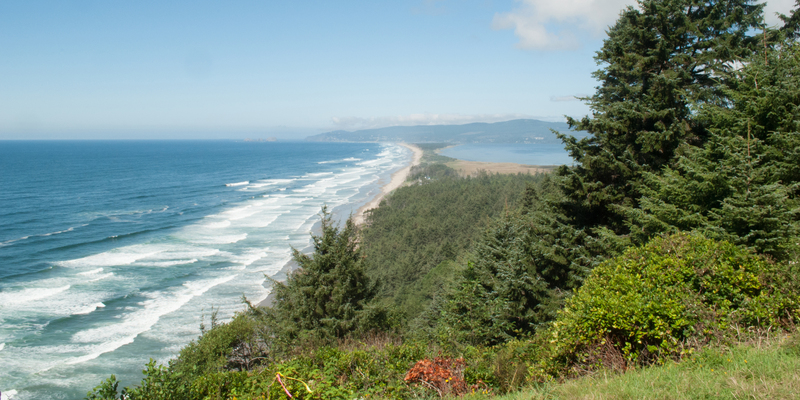 It’s hard to pick favorites, but the Cape Lookout Trail might just be one of them. The 400-foot cliff edge views alternate with dense old-growth forest on this route. Wildlife abounds as well. March visitors may spot migrating gray whales moving north from Mexico with their calves just off the coast. Bring your camera to capture views of Cape Kiwanda and Haystack Rock to the south and Netarts Bay Spit and Cape Meares to the north. This is a popular trail, so you won’t be alone in enjoying the beauty here. At 4.80 miles long, there is a moderate elevation gain of 840 feet round trip.